This episode of Soap Queen TV is pretty long at almost 13 minutes. But I promise, it’s worth it! In this video I show one of my favorite techniques for working with milk – the freeze method. It’s one of the techniques I teach in my Making Milk Soap from Scratch book. 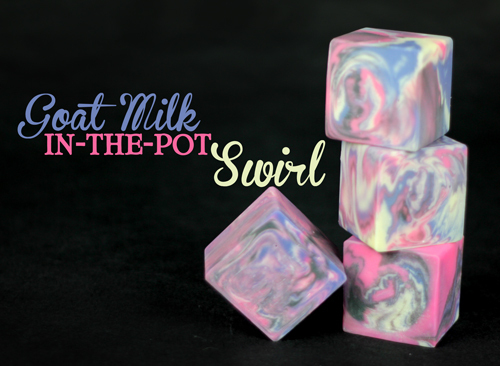 In this video, I create a 4 color in-the-pot swirl and use our silicone cube mold to show that you can get beautiful colors and designs with milk based soaps. Add all of the ingredients and the silicone cube mold to your Bramble Berry shopping cart by clicking here. Will this swirling technique work for a loaf/log mold? I can’t wait to try this! I would love to add an exfoliant like Pumice? Can I do this to the goat milk recipe and if so how much should I add and do you recommend a specific exfoliant for this recipe? Love all your Videos, Thanks again!!! Great work. I’m wondering if you can use colour blocks for goats milk melt and pour? Hi! I watched this video and bought the book on making milk soap, then tried my hand using an almond milk I made from scratch using the method described in the book. I am very confident that the lye was fully dissolved and very confident in my measuring. The soap traced beautifully, and I put it in the freezer overnight. Today when I unmolded and tested the soap, I got a lye zap! First time this has ever happened with my CP soap (although I usually do let my soap sit for a week in the mold before testing). I’m wondering if the very cold temps could have either prevented or slowed down the saponification process? Also wondering now if I should leave this in the mold in the refrigerator (or closet) for a few more days to see if it still zaps, or if I should just give up and rebatch it? Oh no! Do you mind if I ask what’s in your recipe? Also, how long did you stick blend your milk and oils? Also, how long did you let it sit? Typically, it takes about 48 hours for almost all of the lye to saponify. I would recommend letting it sit a couple more days and testing it again. Hi Kelsey – GREAT NEWS! Patience is very much a virtue with this batch. I originally made it on Sat. (11/1) and tested and commented on Sun (24 hrs). I made the decision to take it out of the freezer and moved it to the refrigerator on Sun night. On Wed (96 hrs), it still had some zap, but seemed to be less. Also, shooting the soap with my infrared thermometer showed that although my fridge is at 36F, the soap was still “cooking” at 48F. I left it until today (180 hrs) and tested again (in multiple places through the loaf) – NO ZAP! I think the colder temperature just really slowed everything down. The best news is that the bars are a lovely, creamy ivory color all the way through – no scorching whatsoever. I’ve cut the bars and put everything into the drying rack to sit for a few weeks, and I’ll definitely test the soap myself before giving it to anyone, but I think patience saved this batch. If you are still interested, here is the recipe: 584g Olive Oil; 444g Coconut Oil; 442g Palm Oil; 80g Castor Oil. 225g Sodium Hydroxide dissolved in 528g Almond milk (made from fresh almonds and distilled water). Finished with 60g of BB Almond FO. Added Lye to frozen Almond milk stirring constantly – took about 15 minutes to dissolve and was at 68F. Added lye milk to oils (which were at 80F) and stick blended in pulses for 7-10 minutes to get to a medium trace. Molded in the BB 5lb loaf w/silicone liner. Hot process soap can be tricky because it’s likely the goat milk will scald. Thanks for the swift reply Ma’am. So glad to have found this site! 🙂 I’d like to ask some more question if u don’t mind. 1. Is it preferrable to use powdered neem leaves or the freshly blended one? Does the fresh leaves shorten the shelf life of the soap? 2. Does the 1 tsp powdered goats milk should be diluted first before putting into the mixture? If so, how much water is enough to dilute it? 3. If you were to choose the color for my turmeric neem soap, what would you choose, or do you prefer more the natural color of the combination? 4. Does peppermint with butterscotch fragrance work for this or do you have any suggestion for its fragrance. Adding milk afterward may mean it won’t saponify, so I would actually recommend replacing your water with goat milk. It will discolor because of the scalding. Sorry about the confusing answer! Goat milk typically doesn’t accelerate trace. Do you mind if I ask what else you’re using in your recipe, including the fragrance oil? Also, what temperature are your oils? the colored soap is beautiful, but if I don’t want to use colors, what changes do I make in the recipe? one more question. Is the sodium lactate optional? If it isn’t how do I adjust the recipe. I only have the sodium hydroxide. The sodium lactate is optional. It is added to the lye mixture in order to help the soap harden faster. If you want to omit it from the recipe, you can simply not add it. You do not need to change any of the other ingredients :). Thanks so much! I have everything I need. Can’t wait to make my first batch of soap! Thank you for your video! I was wondering about the temps for the oil and the lye solution…why are the oils at 90 and the lye at 50? I thought they were suppose to be around the same temp? I am new to this and am just looking into a milk recipe. Thanks again! Thanks for the answer!The soap is done,everything went well! If using table salt mixed with water instead of sodium lactate, do you deduct the amount of water used from the amount of milk used? For example, I am using 48oz of total oils and my recipe calls for 15.84 oz liquid (goat milk), should I deduct 3 oz of milk from the total liquid so I can use 3 tsp salt dissolved in 3 oz water? Or should I use the full amount of milk AND the extra 3oz water with the salt? Thanks in advance for your guidance! Thanks so much for getting back to me so quickly! I am planning to make my first batch of goat milk soap tomorrow! I made some GM soap yesterday and used your recommendations about keeping the gm/lye solution in an ice bath. My oils were around 85 degrees. When I added the gm/lye solution to the oils, it just sank to the bottom. When I blended, I had a hard time getting a smooth consistency it seemed grainy – I had to blend it to a thick trace to get a smooth consistency. I could not do a swirl, which was ok, but just wondered if you had an idea as to why it may have done that. I used goat’s milk that I bought at the store – it has added vitamin A & D (goat’s milk that you would normally drink) but nothing else added. My gm/lye solution was cool to the touch – could it have been too cool? I love this recipe, thank you. My question though is this, I have fresh goat’s milk and I am going to try this recipe, however I would like to know if I should boil the goat’s milk before freezing it to use it in my soap? Thank you so much, I know that it is recommended to boil or scald fresh cow’s/goat’s milk before consuming, but yes of course one would not be consuming milk in soap, but I just wanted to be sure if it was recommended to kill any bacteria that may be in the fresh milk but of course I suppose the lye would take care of that. In the video you say to measure the goat milk by volume and not weight. I’m a little confused I thought all ingredients in soap recipes had to be weighed including the water or milk or whatever liquid is used in the recipe. Can you tell me why volume versus weight. Thank you. Great video. Hello Bramble Berry friends! I loved loved Loved the way this soap looked, so beautiful! I ordered the silicone cube mold and made my own goats milk recipe with it. Unfortunately, I forgot to add the sodium lactate! (argh!) So, needless to say, it was 3 weeks before I could get the soap out of the mold without ruining it, when I finally did, however it was beautiful and worth certainly worth the wait. Thanks for your fine products and great customer service! Love the video. The cube goat milk soap is gorgeous. My question is can you do this recipe in the cubed CPOP soaping? I looked at your information on each cube mold, however, I didn’t see any written that you can place the silicon mold in the oven. Okay my daughter and I just tried this recipe using Fizzy Lemonade, Ultramarine Violet Oxide, Electric Bubble Gum, and Titanium Dioxide. We found that the Titanium Dioxide did not want to stay blended with the tablespoon of Almond Oil. I own the 25 square mold but only made the 9 batch because I wanted to be sure it would work for us. The Titanium Dioxide and the Fizzy Lemonade seemed to trace faster than the Bubble Gum and the Ultramarine Violet so our first few cube have more variation of color than the last few, but I think they will all still turn out nice. Just wondered if I was to mix the Titanium Dioxide with something besides oil. Will post photos in a few days then I will try to unmold at the end of the week. Titanium Dioxide can be a finicky ingredient at points, but if we have found that if you use a little mini-mixer (https://www.brambleberry.com/Mini-White-Plastic-Mixer-P4721.aspx) it tends to blend much easier. If there is another lightweight fixed oil you’d like to use (other than the Sweet Almond Oil) to mix it, you can definitely try it out. Also, you can micronize titanium dioxide with a spice or coffee grinder and that typically helps it to disperse easier and reduce the presence of white speckles in the final soap. We’ve done it with Sunflower and Olive Oil before as well. How much Titanium Dioxide are you using? Typically we like to do 1.5 teaspoons of it in 1.5 Tablespoons of oil for cold process. P.S. What fragrances did you use? I am going to make milksoap today, I have condensed goat milk that needs to be mixed with = amounts of water. Is this going to be ok ? Thanks for all of your wonderful work and videos! I love this tutorial!! The ice technique is a life saver! I have made one batch so far just using one colorant for a swirl. It was a green and the rest of the soap was nice and ivory looking. As soon as I was done pouring in the mold I put it in the fridge, within an hour, the green colorant had turned brown, but the rest of the soap is still ivory. I stuck it in the freezer for about 2 hours just to be sure, but I can’t figure out what went wrong! Did it get too warm? Any suggestions? Isn’t it so exciting to try a new technique in soapmaking? We can’t wait to see how your soaps turn out and if you get any pictures, be sure to share them with us on Bramble Berry’s Facebook page. Some colorants do morph and change in cold process soap, so you will always want to make sure and read the individual product notes before using them in your batch. Was the green color one of Bramble Berry’s? Well turns out it was just the cold temp that turned the color. Once it was out of the fridge and warmed to room temp, it turned back to the beautiful green! Ha! I was so glad! It was not a BrambleBerry color this time, I normally use BrambleBerry, but had this one from another vendor and decided to try it. I’m so happy it turned out! I’ll post a picture and share it on Facebook to show the great result! Thanks so much for your help! LeslieGail asked why use goat milk in soap. I have psoriasis and that’s the whole reason I started making my own soaps. The milk really soothes the skin and keeps the outbreaks and itchies in check. Various members of my family have eczema and they agree. I love love love looking at the pretty swirls and what not in bars of soap, but these artificial colorings react with sensitive skin (Clays are okay, hurrah!). I do a LOT of milk soaping and this method with the frozen milk and ice bath is the only way I roll! I use double-fat, double-strength goat milk with no additional water and the milk/lye mixture is so thick that it looks like pudding when I add it to my oils. The first time the “pudding” mix sunk to the bottom of my oils in a glob I was horrified! Haha. I was sure it would never emulsify but it did and always does. It’s a lot of work but makes for an unbelievable bar of soap. Oh, I also use lye micro beads which dissolve very well in my thick milk mixture. Today I tried something new. I designed a baby soap for our “Foal” line. Lots of little Foals arriving this spring plus another little Filly in our own family! I wanted a very moisturizing goat milk and oat soap but did not want the oats themselves to be in the soap as they can irritate tender baby skin. So I made some oat milk (oat sludge would be more accurate!) by tying some rolled oats in a nylon stocking and soaking the stocking in boiled distilled water. I kept squeezing the stocking and extracting all the goodness of the oats without the fibrous husk part. I froze the oat milk and used it right along with my frozen goat milk. This time I got much thicker pudding! But it’s all good. Everything came together as usual and my soap is abed in the curing room as I type this. I also held back about 1/4 of the batter, added some oats I had powdered in my magic bullet, and also some Banana FO and yellow pigment. Now the Mares, Stallions, and older Colts and Fillies can get smooth-scrubbed hides as well! Hi, I know someone just asked this, but I am still not clear on whether or not to include the sweet almond ( or olive oil) used to mix colorant in my lye calculator? If I understood correctly, if you are just using one tablespoon of oil/colorant mixture don’t bother but more than that ( say I was doing a 4 or more color swirl with each color mixed in 1T sweet almond or olive oil) then I should include that in my lye calculation??? For example: In the tutorial, There were 4 T sweet almond oil used ( approximately 2 oz) with probably at least 1oz or more of those oils used in the recipe to color the batter, was the sweet almond oil factored into the amount of lye used in this particular recipe? The key to answering this question is: will the addition of extra oils affect my superfat significantly. For me the term ‘significantly’ means more than 2%. And, for a recipe this size, 1 or 2 tablespoons is not even going to move the superfatting dial by 1%. So, it depends on the size of the batch if you’d include it or not. The worst that happens is that you have a higher superfat than the recipe calls for if you don’t take it into account. Hi! I loved this video! This is also something I’ve been dying to try. I have a question about the actual milk. When I wanted to make this in the past everything I saw said you need to use raw goat milk, which it turns out I have not been able to find searching pretty much every health food store in town. Your recipe does not say what specific milk is used in terms of raw or pasteurized?? I was able to find powered which I saw brambleberry sells but was not sure if either are pasteurized or raw, or if in either of these it even really matters??? Thanks for your help!! You can use whatever GM you can find – but just make sure there aren’t any extra additives like guar gum or sweeteners. It’s not the end of the world if there are but any extra additives can cause a problem in your soap. Wow this is so beautiful…I can’t wait to try it. I just love GM soap. Great for the skin! I do have a question though….in my frenzy the past couple of weeks ordering goodies from you (and it has been just about weekly…LOL) I was looking at this recipe and my supplies. OMG. I don’t have sodium lactate. What do I do? I have made GM soap before with olive oil as an ingredient and it has been fine…I have a batch curing right now in fact. Also, I have the BB 12 cube silicone mold, how do I adjust recipe for this one please……thanks for your help Anne-Marie. I have learned so much from this site. Your customer service is TOP-NOTCH. The ladies are amazing and are ALWAYS so helpful when I call! Keep up he great work! The only reason you really need the sodium lactate is to help with the easy release of the mold. It’s perfectly fantastic soap without the sodium lactate but it takes an extra long (over a week probably?) time to release without it in the silicone cube mold. Hey Anne-Marie, thanks for the info. So its the GM that really makes it take so long to release from the silicone? I suppose if I decide to do this recipe …which I am def going to do….I will just have to leave it in the mold for a week! I am getting ready to make my first batch of goat’s milk soap. Are there any fragrance oils that are not recommended for using in milk soap? Thanks for this video, Ann-Marie! Your ITP swirl soaps turned out great – that’s such a fun technique. I prefer to freeze milk, too. I’ve done only a couple of batches of goat’s milk soap, but I’ve got more in the freezer, along with some coconut milk, buttermilk, and cream. I need to make some more milk soaps soon because they are soooo nice! Beautiful soap! I have a question that I have been wanting to ask about goat’s milk soap in general. At my festivals there are always a few potential customers who, after finding out that I do not add goats milk to my cp soaps, walk right out because they are convinced that my soap is not as good. What exactly does goat’s milk add to CP soap? Another soap maker at a recent festival who also does not make goat’s milk soap said many people love it for the lather. I feel with my combination of oils, my lather is just as wonderful. I’ve also read about the caprylic acids in goat’s milk soap, but do any benefits remain after the saponification process? Is there anything to goat’s milk soap that makes it better than a well formulated bar of CP soap or is it just that both are better than store bought “soap”? That is a great question. Goat Milk (and milk soap recipes in general) soaps add a very nice and creamy lather that is super moisturizing to the skin. Many people like it because it is such a mild kind of soap for those with more sensitive skin. It really is a personal preference if you use Goat’s Milk in your soap or not. I’d try taking your favorite recipe and replacing the water in it with Goat’s Milk to see what you think of it. Thank you for your quick reply Becky. I did try a goat’s milk batch once and couldn’t tell any difference in that and my regular cp bars. I love this tutorial – thank you so much! I have been wanting to make Coconut Milk soap for ages. Am I correct in assuming I can use this exact recipe and just substitute out the Goats Milk for a can of Coconut Milk? Also, I have had difficulties in getting soap out of this cube mold before. How long do you recommend freezing it? RE: fragrance: I have some Blackberry, raspberry, & strawberry FO’s that I have been wanting to try out, but the sun ripened raspberry FO description states that it moves quickly in CP. Do you have any recommendations? Would another scent be better with the blackberry & strawberry where I wouldn’t have to worry about it moving too quickly? With this particular recipe, you would leave it in the freezer overnight (12 hours), which just enough time to ensure that no gel phase occurs. If you are wanting a Blackberry/Raspberry type fragrance in your cold process soap, I’d try out the Black Raspberry Vanilla Fragrance Oil. You get the notes of both the blackberry and raspberry with that extra delicious scent of vanilla. And the best part about this fragrance oil is that it doesn’t discolor! But, you can totally use any fragrance that doesn’t accelerate on you like the Blackberry Cybilla or Strawberry Fragrance Oils. Just be aware if you use Strawberry, it is a bit light in CP. I tried this recipe using Coconut Milk. But I didn’t notice that the can had “Guar Gum” in it and my milk & lye mixture was very “gummy.” It was kind of like molasses, but it did mix up with the oil to a nice trace. It acted like any other batch of CP when I mixed to trace & added the colors & fragrance. Any idea how this will turn out? Any one out there have this experience? Yeah, Guar Gum is an ingredient to avoid. It’s in so many things. It’s definitely a gelling agent. However, if you got the soap to come to trace etc… you should be okay. Keep us posted after you cut. I went to the store today to try to find some coconut milk without Gaur Gum and couldn’t find anything that didn’t have it as well as lots of other additives. I did find some coconut water without additives and wonder how that would be in soap compared to the milk? I also found some powdered Buttermilk and wondered if you have tried that in soap? RE: another blogger on here asked about sodium lactate. Am I correct in assuming from that discussion that if you are NOT using the cube mold, you don’t need the sodium lactate? Also, without the gel process, soap seems to come out really dull looking, so I added some Silk to my batch and it seemed to really brighten the colors. I didn’t change anything in the lye calculation adding silk & sodium lactate. Should the milk be discounted with these additives to the lye-water/milk mixture? Hi Sly! I can’t wait to hear more about your milk soaps, you are seriously going to have so much fun. You might have to ask around about the Coconut Milk, but I know there are some brands out there without the Guar Gum. You can totally use Coconut Water in your soap, but don’t be surprised when it turns your lye-water mixture an orange color. Don’t worry though, it won’t affect the color of your soap. Depending on your recipe, you might actually need to use Sodium Lactate, but you will want to with this recipe (and mold) because it is a little harder to pop out. The Sodium Lactate actually helps to harden up your soaps and make it easier (and faster) to unmold them. Thank you about the info about the coconut water turning orange – I would have been quite surprised otherwise!! Thanks for the link to the Bastille Baby Bar – I had seen that before and forgot that it was made with buttermilk. I can’t wait to try it! I have powdered buttermilk. Would you recommend I mix it with water according to the directions or just get fresh buttermilk, like on the recipe? I read somewhere about using distilled water with lye, then adding the powdered buttermilk at trace, but I don’t have any idea how that would turn out. We love using powdered goats milk in our recipes, but we’ve never tried powdered buttermilk. I would highly recommend doing a small test batch to make sure it works out. We’ve had success rehyrdating goats milk according to manufacturers instructions and then subbing that out for the distilled water in regular recipes. You can also do this in place of the 7 oz. of fresh buttermilk that the Buttermilk Bastille Baby Bar recipe calls for. P.S. Be sure that your buttermilk doesn’t have any sugars in it because sugars can superheat soaps. Try to find a buttermilk powders with the least amount of additives. I watched the video and took notes. Fortunately, the Buttermilk I got at the health food store has no additives – Yay!! Hello Anne-Marie.I have a question as to why we need to add Sodium Lactate to the soap, especially the milk one? I would love to know more about this ingredient. Thank you! This was a great tutorial Anne-Marie. Love the colors and the look in the middle when you cut the soaps. Thanks for a fun one! Great video! Love the recommendations on how much lye to add & at what intervals to the milk. Question: How long do you recommend leaving the soap in the fridge? Is it the same 24 hours that you would normally leave a soap before unmolding? Thanks for watching the video! If you end up making Goats Milk soap, we’d love to hear how it turns out for you. =) When you are leaving the soap in the fridge or freezer, we suggest leaving it overnight (12 hours) which will be enough time to ensure that the soap does not go through gel phase. Thank you so much for this video Anne Marie! You have made milk soap much less intimidating than I once thought it was! Tried my first batch recently and it was great. I only froze my milk for a few hours so it was slushy not solid which made the end product a bit darker but there was no unpleasant smell at all. Next time ill freeze the milk solid for a whiter soap. Can I subtract a tablespoon of oil from my batch of oils to mix the colorant and then add it back in or should I use more oil separate from my soap batch? Great Video, But I have a question, at the beginning it says to use half goat milk than your recipe calls for water… but when I use the bramble berry lye calculator with these exact oils and measurements, it does say to use 12.4 oz of water for this recipe and here she uses 12.4 oz of frozen goat milk? I’m a little confused!